Drifting through the Tokyo underworld. We caught a late afternoon shinkansen back to the capital. The return half of the ticket had been for around 8pm but we just couldn’t wait that long, we just wanted to get back to the excitement of the big city nights. At the shinkansen counter they changed our train ticket without penalties and before we knew it our sleek train was slipping away from boring old Kyoto. Most of the people on the train were businessmen or groups of schoolchildren. Walking out of Shinjuku Station the rays of neon were as refreshing as feeling sunlight at the end of a thunderstorm. I glanced up at the Alta Studio screen, supposedly the world’s largest t.v. screen and they were showing a news article about the discovery of a teenager’s mutilated body which i’m guessing was the case of the Sasebo schoolgirl murder. Alot of people were looking up at the screen, some had been stopped in their tracks, one man who was watching the screen while waiting at traffic lights sniggered and said something to a companion. I imagine this was the story that was holding the Japanese in it’s grip. We wandered through Kabuki-cho, it was dare I say, refreshing, when groups of African touts approached us to try and get us into some establishment so that they could get their commision. 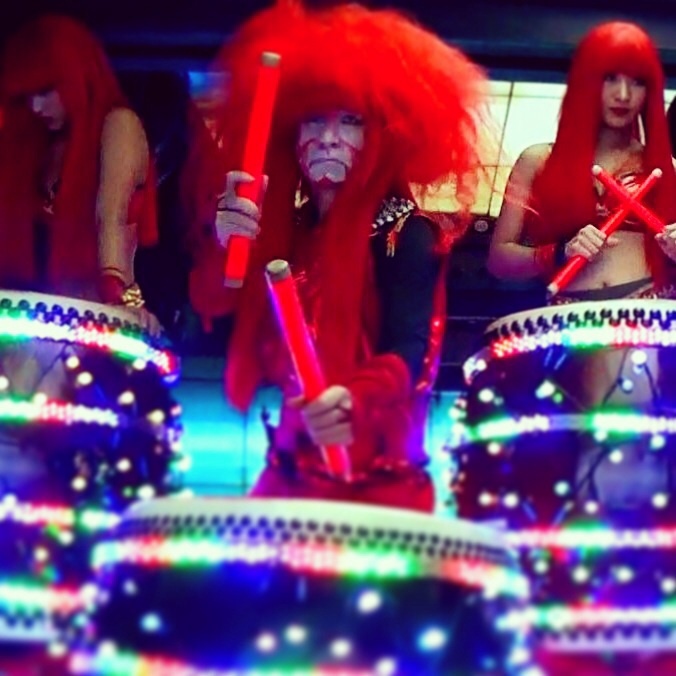 After checking into our hotel we hit the streets, ate Italian at a nice place with the original name of Italian Pizza Cafe on Yasukuni-dori then went to the futuristic show at Robot Restaurant which had mixed reviews, poor food and great entertainment. The Robot show was fun, kind of like a safe go-go poledancing nightclub which would now and again be invaded by huge robots, gigantic bunny rabbits being shot out of cannons, cyborgs fighting with teddybears, girls in bikinis wailing out strange childlike music. Sadly, every quarter of an hour the theatrics would stop so that they could sell drinks. Bizarre, but that is what Japan is like. Our flight back to Europe was leaving from Haneda Airport in the south of the city so for our last two nights in Japan we stayed in Nihonbashi which was closer to Haneda. I had originally planned to stay in Nihonbashi for the whole duration of my stay in Tokyo but I guess the lights of Shinjuku had been too intense to ignore. Still, I had two days to wander around this historical area, the original core, in ancient times known as Edo. One overcast afternoon I crossed the blue, iron arched Eitai Bridge and stopped to peer into the murky brown Sumida River. As I stared across the river bank towards the skyscraper condominiums of Tsukishima a futuristic glass Himiko water bus slid past underneath, it was then I realised I couldn’t help but feel affection for Eitai Bridge. An old, lost relic trying to hold on as it’s surroundings raced on into the future. Once a famous spot where you could see Mount Fuji, the view preserved in the form of Ukiyo-e woodblocks, it seemed now the ninety year old bridge was out of place, almost like an elderly person being exposed to rap music, unable to grasp what it was all supposed to mean. Once the Sumida River had been the heart of the great city, lined with wooden shacks, boatmen would ply their trade, there were animation zones where you could see puppet shows and exotic animals, crude peep shows and all forms of raffish tricksters. Much later in the 18th Century Cherry Blossom trees had been planted ascending the river in the minds of the population. The water was once described as pure enough to make tea. Now the only precious flowers that appear along the river bank are the forgotten moth-eaten homeless, scaveging for food through the trashcans and sleeping under the iron girders. I realised Eitai Bridge had survived through the horror of the mid 20th Century when the bridge itself had been newly constructed after the Great Kanto Earthquake of ’23. The earthquake occured around midday when people were preparing lunch causing a firestorm which sucked houses and people into the air and turned the river red. One horse was seen running through the streets, maddened by the flames it jumped into the boiling river, as did many people. Men working on the nearby foundations of Edo Castle discovered hitobashira, or Pillar Men, when the foundations had been disturbed due to the earthquake. Pillar men where most often volunteers sacrificed alive within the structures of bridges and buildings thought to give the structures extra strength, sometimes hitobashira were chosen as for example the first man to walk across a bridge wearing a certain form of clothing, so they were not all volunteers. Once a one-eyed woman with a wooden leg had offered to become hitobashira with the condition that her son would be made a samurai. After becoming interred her wish was never granted and she is said to haunt the area at night. It was hard to believe that after all that Nihonbashi was once again reduced to cinders by a swarm of B-29 bombers, the napalm cluster bombs resulting in fatalities on par with the atomic bombing of Hiroshima. The greatest decimation was in Koto and Chuo (Nihonbashi), a working class area exactly where I was standing. On the night of 9th March 1945, exactly seventy years ago, it’s estimated over 120,000 people were killed in one raid alone. I stood there thinking of the horrors of war and one photo in particular I had seen of the Tokyo firebombing, the charred remains of a woman and baby lying in a street gutter. The area of Nihonbashi has been reincarnated as a business district with wide boulevards and traffic clogged intersections. As I watched the smartly dressed workers with their lunches and smartphones rush to the glass and chrome office blocks I couldn’t help but feel admiration for this city and it’s people. It was here that I understood what Tokyo is and was, maybe not the most beautiful city on Earth but one which had refused to give up and had risen again and again to fight another day, a true shooting star across the face of our planet. Good Karma!! 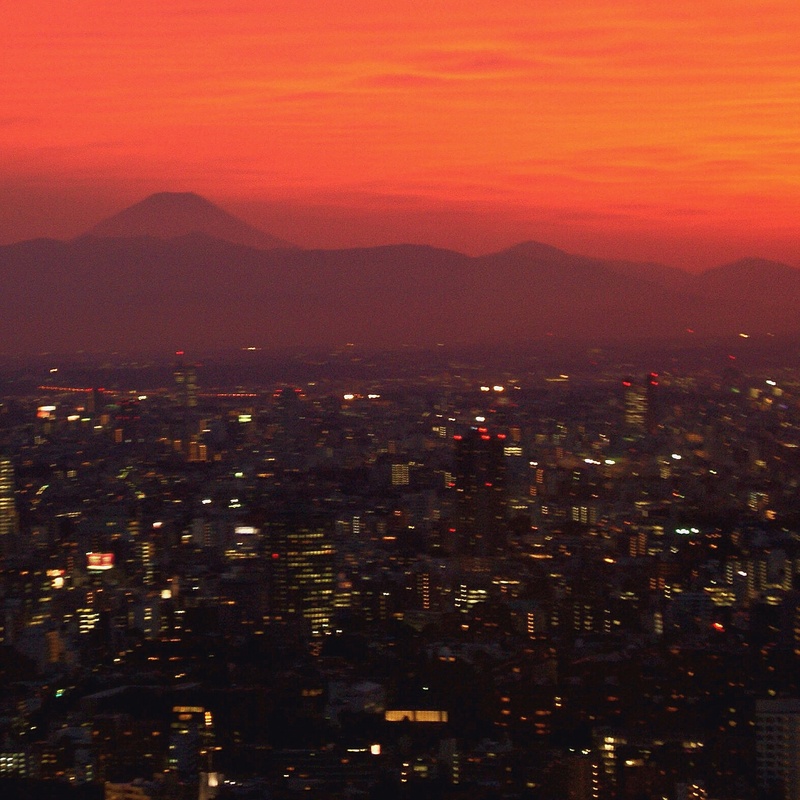 My biggest wish in Japan was to see Mount Fuji and it came true at sunset from the top of Tokyo Tower!! There were so many things to see and do in Tokyo but rather than rush from location to location we just drifted through the streets and absorbed the city ending up in highend stores with their ubiquitous jazz music, pristine gardens, purikura photo booths, shrines dedicated to foxes, gaming arcades, bars the size of bathtubs and miles and miles of tunnels connecting one metro station to another. One thing that was on our list was to go to Tokyo Tower, the cities own version of the Eiffel Tower, only painted bright orange to conform with aviation laws, built in the fifties when Japan was going through a French phase (when is Japan not going through a French phase??). A new addition to the Tokyo landmark scene is the Tokyo Skytree, higher than the Tokyo Tower although we heard that the views were not as spectacular. Plus the Tokyo Tower looks like the Eiffel Tower with carotene poisoning while the Skytree is nothing but a big torch stuck upright in a residential neigbourhood. We got to the orange tower at sunset. I had given up ever being able go see Mount Fuji and felt I must have had too much negative karma but from the corner of my eye I noticed a large mountain looming in the distance, I knew it must have been Mount Fuji but asked an attendant and she confirmed it was my beloved mountain. I just stood mesmerized, the sky went from blue to candyfloss pink to an intense crimsom before turning jet black. 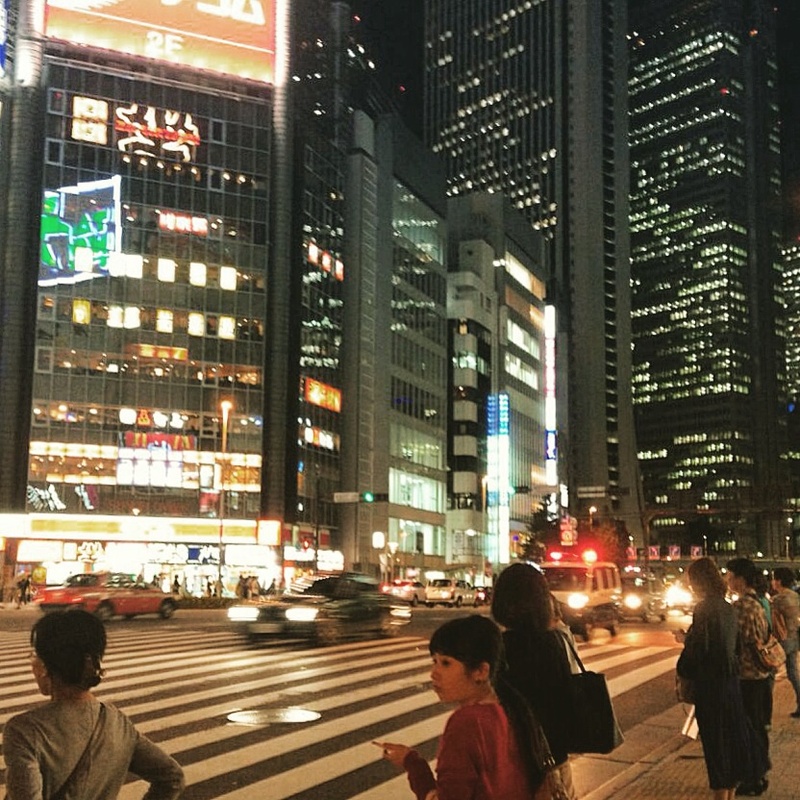 It was the highlight of my trip to Japan and I grudingly admit that for once in Japan I was truly…impressed. It’s strange how Japan turned out for me, while I thought modern post-war Tokyo could never have compared to somewhere as ancient as Kyoto in the end I preferred the scarred futuristic capital. This entry was posted in Japan and tagged Edo, Ginza, Haneda Airport, Kabukicho, Kyoto, Massage parlours, Nihombashi, Nihonbashi, Redlight, Robot restaurant, Tokyo, Tokyo tower. Bookmark the permalink. ← Kyoto and it’s pitfalls.